One of my secrets for permanent weight loss, disease prevention, changing your body and transforming your life is to implement two healthy changes each week with the Power of 4: nutrition, lifestyle, exercise and supplements. Every week you will add two more healthy habits. An incredible book with practical, scientific, up-to-date information that will transform your health and your life. I sincerely believe this book should be used as a text in any institution of higher learning where the student is pursuing a degree in nutrition, exercise physiology or dietetics. Paula walks the walk! This is a terrific program that can benefit and empower you! I love this book. The Power of 4 is one of the best nutrition books I have ever read. The information is cutting-edge, presented so well and simply. It is a great mix of scientific knowledge, holistic wisdom, and practical information designed to maximize results. The Power of 4 is a must read for all trainers as well as people genuinely interested in enhancing their health and fitness performance. I recommend this book to all my clients looking to improve their nutrition. 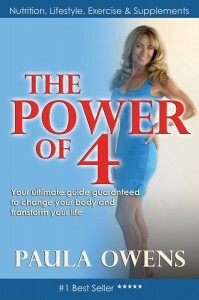 The Power of 4 provides truthful solutions for well-being, fat loss and total health. The Power of 4 is a very informative book on how to navigate the challenges that are associated with today’s lifestyles. Paula provides insight, experience and opportunities to create better health. Her research, credibility and experience gives unique insight that motivates one to recapture their optimal wellness. I recommend The Power of 4 to my new patients in an effort to empower them to feel better as quickly as possible.